Purest lines. Purest light. Luxurious simplicity. Inspired by the Golden ratio, PHI-JEWELRY finds its magic in the quest for quintessential forms and light that brings Beauty to Life. The Golden ratio has been known since the Antiquity to define Divine proportions-- the most aesthetically pleasing forms. Throughout history, thinkers across all disciplines have been captivated by the mystery this number seems to hold, the key to creation (mollusk shells, sunflower florets, rose petals, shape of the galaxy.). From the Parthenon to Leonardo da Vinci's Mona Lisa to Salvador Dali's The Sacrament of the Last Supper, poets and composers have used it in their works. PHI defines a world where order, Beauty, and eternal mystery naturally coexist. Maren SOSTMANN and Veronique GAUTIER have designed their first collection, an uncluttered luxurious range of jewelry and hair accessories. An invitation to re-discover the powerful statement of the dot, as a definitive Design statement. In a world of overstatement, PHI redefines style: pure exquisite diamonds on a simple thread or gold-platted stick. PHI offers a luxurious hair accessories and jewelry collection to enhance the Beauty of the Bride-to-be. The PHI Hair accessories Collection will create the most elegant and pure hair styles for wedding. 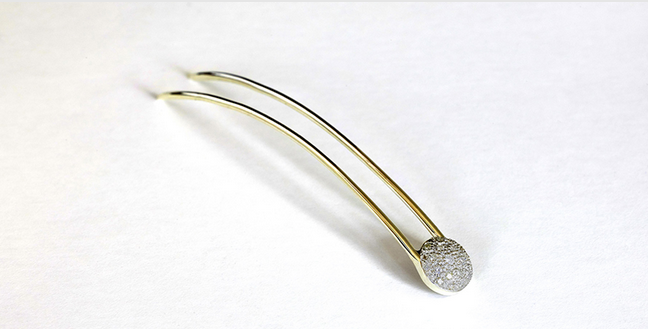 The PHI Hairpin pave is available in silver and gold plated. The pave holds 22 diamonds for a total of 0.45 carat. The PHI Hairstick comes in two lengths 6’’1/4 or 5”1/4, and three colors: yellow, white or pink gold plated. The pave holds 7 diamonds for a total of 0.12 carat. All made in New York and handmade setting. The PHI Jewelry collection offers several ways of personalizations. - 3 diamonds sizes (1/4, 1/3 or 1/2 carat).